While most conspiracy theorists don’t have saliva dripping from the sides of their mouth, a huge number of them are just as sub-human and cold-hearted as the Sandy Hook hoaxers. For all conspiracy theorists, notice who some of your bed-mates are. ----One man traveled from Virginia to Newton, robbed playground signs memorializing two of the children, then phoned their parents saying they shouldn’t be upset because their kids were fictional characters both part of a conspiracy. ---- Veronique Pozner’s husband Lenny attempted to answer the hoaxers by releasing his son’s birth and death certificates, as well as the medical examiner’s report. Without any evidence the hoaxers deemed them counterfeits. He also joined a prominent Facebook group of hoaxers to try to correct their suspicions. Some asked sincere questions but many simply launched profanities or asked about theories that had already been debunked. ---- Lenny Pozner received many emails asking for “proof that anyone died at that dilapidated dump of a school,” then adding: “One more thing before I close, your wife is uglier than sin.” These trolls also posted on social media that he was a child pornographer. 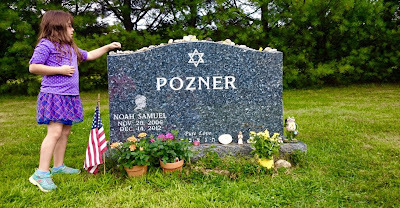 ---- Hoaxers compiled what became a widely viewed video montage of Pozner’s deceased son Noah “set to a soundtrack of pornographic sounds”. ---- Because of Halbig’s relentless harassment of the families and officials involved, the Florida police visited his home and told him Connecticut police were going to charge him with harassment if he didn’t stop. This catapulted him to celebrity and hero in the sordid world of conspiracy theorists. ----Halbig’s viciousness also went as far as propagating that one of the little girls was not killed but living by another name with another family. The two girls can seem to look alike “if you pick the right photograph from the right angle”. The actual living girl – still living in Newton and now 12 years old – if she were to Google her name, would get numerous results claiming she is in fact her deceased schoolmate and part of the conspiracy.